﻿ Easy Inn Hostel, Tainan | FROM $13 - SAVE ON AGODA! "Decent breakfast in the morning"
Have a question for Easy Inn Hostel? "The staff however was incredibly friendly and allowed us to stay for free on the night we wanted to stay here." "GOOD stay, will come back again, thanks Easy Inn Hostel." "Very friendly staff at reception." Situated in Tainan City, Easy Inn Hostel is the perfect place to experience Tainan and its surroundings. The property offers affordable and cozy space for long-way travelers, inviting everyone to experience the hospitality of Tainan, to feel young and energetic again. Guest will enjoy sharing culture and stories with the locals. One does not travel in order to arrive, but for the sake of travel itself. This hostel is not only for sleep, but also a relaxing place that maximize the value of your long-way out. Whatever the reason for your stay, Easy Inn Hostel will make your stay a good one. As a well travelled person who frequents these type of budget accommodations, you really notice when places do things right. After a long day of sightseeing, there are some things that are musts, as well as things that make life easier. Easy Inn delivers on both. The rooms are clean, modern and well appointed, so they are already off to a good start. I love a nice hot shower, and unlike a lot of Taiwan's cheaper accommodation, our room had a very big shower, with sliding glass doors, lots of hot water and a nice big mirror. But there are two selling points for this accommodation that set it apart - The free laundry and the rooftop area. As most travelers know, after a couple of days of living out of a small suitcase, you always scramble for a Laundromat. However, it can often be hard to find, especially self service 24 hours. This hotel has 3 machines that are free to use, in a dedicated laundry space. In terms of the rooftop, it is a cool place to go and hang out at night, and see the Tainan city lights, or have breakfast in the morning. The only sour note that we had concerns the breakfast. We stayed for two nights. First night, not a problem. The breakfast is in a dedicated dining area, and it was simple, tasty and plentiful. HOWEVER, on the second day, we had planned our check out so that we would have everything packed, and just jump up and grab breakfast before leaving. However, breakfast only seems to be provided in the hotel during weekends - otherwise they give you a voucher for a restaurant downstairs! Now, this would normally be fine with us, however we were not told about this at any time, and in our case, it ruined our timeline for our trip, so we had to get breakfast elsewhere. This miscommunication may have come because of the limited English spoken in the counter. That said, apart from this, we experienced a great stay in Easy Inn, and would highly recommend it to anyone wanting budget accommodation. It is about 20 mins walk from Tainan Railway Station. For first time travellers to Tainan, public transport could be difficult, so I opted to walk since it is just a straight road down. I reached the building where the hotel is situated above, signages were obvious but occasionally I would miss them and need to turn back. 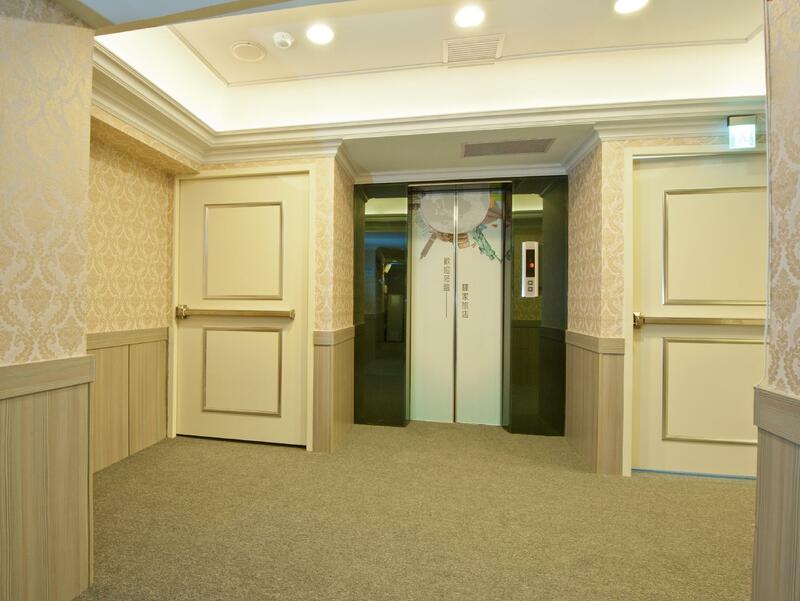 It has a private lift situated away from the residential lift. And the lift electronic display is constantly out of order, thankfully I read a pasted notice about it before panicking. Check-in on the 9th floor was not very smooth because reception staff was missing for over 15 minutes and there was no bell to ring etc. But in return I got a free upgrade from a single room to double bedroom. The breakfast option was quite interesting to me; because since the hotel does not have any cooking facilities, it collaborated with nearby eateries to issue breakfast coupons to guests. So the guest could choose between 3 types of set meals and I opted for the rice dumpling set. (Very tasty!) Room is comfortable but feels like a normal home setting. I had some difficulties switching on aircon and realised the reception did not switch on power supply to my room. Facilities such as kettle and fridge are available. Bathroom facilities are also ok with hot water, toothbrushes, towels etc provided. The hotel (wholly on the 9th floor) has a hostel operating upstairs from the 10th floor. It is near to Chihkan Towers and some major eatery areas opposite the towers. A walk further there will be many bridal shops as well. GOOD stay, will come back again, thanks Easy Inn Hostel. Getting to the hostel from the train station by bus is a little tricky. Best to go by taxi or just walk straight out from train station abt 15-20 mins. Its diagonally opposite across the junction from the always crowded Dan Dan Burger. However things get easier from the hostel to other places of interest. Guohua St aka food st is just beside can walk all the way down to Bao'an St. Chihkan Tower is nearby too along with some popular temples and also the bus to Anping. Overall the basic facilities are there and working fine. Staff are also very helpful. the only thing to complain about is the shower room with toilet. it could be an issue if the 10 person dorm room fully occupy because there is only 1 in the room, but you can use the another 1 on the room passage. the small locker located on the bedside not for luggage storage and you have to use your own lock. i don't use the locker since the important stuff always with me. but the room is spacious. the hostel offer 3 choice of breakfast vouchers on weekday,i specially like the veggie sandwich. and the buffet breakfast at 11th floor on weekend. all the historic temple, ruin and night market are possible to reach by 20 min walking from the hostel, i have rent a bicycle from the hostel to visit all those place and the further anping fort. during my 3 night stay i have met some guest that share interesting story. it was a pleasant stay, i will recommend this place to solo traveler and backpacker. The area around the hostel has many different kinds of delicious local foods. The staffs are really helpful. The internet connection has a problem on the night that I stayed, then the staff is really good enough to share his own phone data for me so that I can continue my work. Besides that, the bed is big and comfortable. The staff was nice but had a hard time communicating in English. I appreciated the breakfast coupons for veggie options. The rooms have space for several suitcases. No real lounge area and looks in need of some renovations. Curtains in the dorm rooms for the beds were appreciated. Room - very spacious single room given its price, can easily fit 2 persons in. and its clean Location - very near Guo Hua street where you can get a lot of famous Tainan local delight and they are really delicious! It is also walkable to chi kan lou where you take the tourist bus to An Ping area. Hua yuan night market is also just 10-min walk away I also like the idea where they team up with the shops just below the hotel to provide breakfast. Overall, it was a very decent stay. It was really amazing! We had been upgraded for free to a classical room and it was wonderful! We got daily cleaning, towels and toiletry for free everyday. Although the normal rooms also did look great. Breakfast was great (you got three different options to buy it whenever you want in a store and on Sundays there was a big buffet in the hostel). They offer rental bikes for free and help you with every thing! Everything is very clean, comfortable, friendly staff and air conditioning in the rooms. If you ever go to Tainan- ->this is your hostel! The place was easy to find and check-in was quick and easy(you need to give a refundable 100NTD deposit for the room key). I stayed in the dormitory room which had comfortable beds and its own bathroom. The room had cable TV, AC, free Wi-fi, hairdryer, shampoo, body gel. Each bed had reading light and universal power plug as well as a bedside locker (although the lock on mine was broken) and privacy curtain. The room was generally clean (they came in to clean every day) however they didn't take the previous guests' towels until the second day. Breakfast was provided each morning with a choice of Western-style(bread and various spreads) or Chinese-style(congee with various sides) as well as hot soy milk, tea and coffee. They even catered to my vegetarian diet when I asked them. A plus was the rooftop balcony which had a great view over the city. The staff were generally friendly and knowledgeable. The location is close to local attractions and around the corner from a street full of many eateries. Overall a good place to explore Tainan from. A 20 minute walk from the railway station. Easy to find. Nice modern, big, clean room. Free WiFi, cable TV and comfy big bed. Very nice reception staff. Plenty of places to eat close by. Very pleased with my choice. At the railway station is a visitor information centre. I recommend bus 88 or 99 which do two routes around the main sights. About 80TW$ for the days on / off ticket. The Easy Inn is part hostel, part hotel and is situated on the ninth floor of a tower block looking out over Tainan. Our room (a double) was clean, simple and had everything we needed. The staff were friendly and helpful. All in all, good value for money. Definitely recommend it! It was nice to see smiling people at the hostel after a long trip to Tainan. As I did not expect to find a cozy and clean budget place to stay in the center of that old city, EasyInn truly surprised me. It's newly renovated. I booked for a bunk bed in 10-bed mix. To me the personal space was more than enough. There's privacy curtain for each bed that isolates the room light, when it comes late, everyone can start using the small reading light by their beds instead, without disturbing others when they still making plans or do some reading. I thought that's a very cool feature. I can only give the cook full compliments for preparing the wonderful breakfast. They have good services! Thanks!! !